This article is about the mathematical notion. For its applications in geodesy, see great-circle distance. For the fictional interstellar organization called Great Circle, see Andromeda (novel). 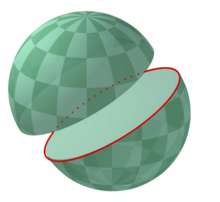 For most pairs of points on the surface of a sphere, there is a unique great circle through the two points. The exception is a pair of antipodal points, for which there are infinitely many great circles. The minor arc of a great circle between two points is the shortest surface-path between them. In this sense, the minor arc is analogous to “straight lines” in Euclidean geometry. The length of the minor arc of a great circle is taken as the distance between two points on a surface of a sphere in Riemannian geometry where such great circles are called Riemannian circles. These great circles are the geodesics of the sphere. In higher dimensions, the great circles on the n-sphere are the intersection of the n-sphere with 2-planes that pass through the origin in the Euclidean space Rn + 1. To prove that the minor arc of a great circle is the shortest path connecting two points on the surface of a sphere, one can apply calculus of variations to it. which is a plane through the origin, i.e., the center of the sphere. Some examples of great circles on the celestial sphere include the celestial horizon, the celestial equator, and the ecliptic. Great circles are also used as rather accurate approximations of geodesics on the Earth's surface for air or sea navigation (although it is not a perfect sphere), as well as on spheroidal celestial bodies. The equator of the idealized earth is a great circle and any meridian and its opposite meridian form a great circle. Another great circle is the one that divides the land and water hemispheres. A great circle divides the earth into two hemispheres and if a great circle passes through a point it must pass through its antipodal point. The Funk transform integrates a function along all great circles of the sphere. Great Circles on Mercator's Chart by John Snyder with additional contributions by Jeff Bryant, Pratik Desai, and Carl Woll, Wolfram Demonstrations Project. Navigational Algorithms Paper: The Sailings. Chart Work - Navigational Algorithms Chart Work free software: Rhumb line, Great Circle, Composite sailing, Meridional parts. Lines of position Piloting - currents and coastal fix.